Comments: Though small and unassuming, the astromech droid R2-D2 has proven to be a pivotal figure throughout the quest for freedom in the galaxy. Whether delivering Princess Leia's message to Ben Kenobi or accompanying Luke Skywalker in his X-Wing fighter as he delivered the fatal blow to the first Death Star, Artoo's actions have become legendary within the annals of the Revel Alliance. 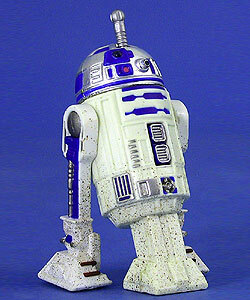 But unknown to his compatriots, Artoo already had plenty of time and experience at the center of action. Many decades earlier, he served on board the ship of the young queen from the planet Naboo. Even then, he displayed an unmistakable knack for helping others out of dire circumstances. The lightsaber is notched to lock down inside the spring-loaded body. The card was changed from a 3/4-view pose to a straight-on pose, and the saber changed to the opposite side of the bubble.